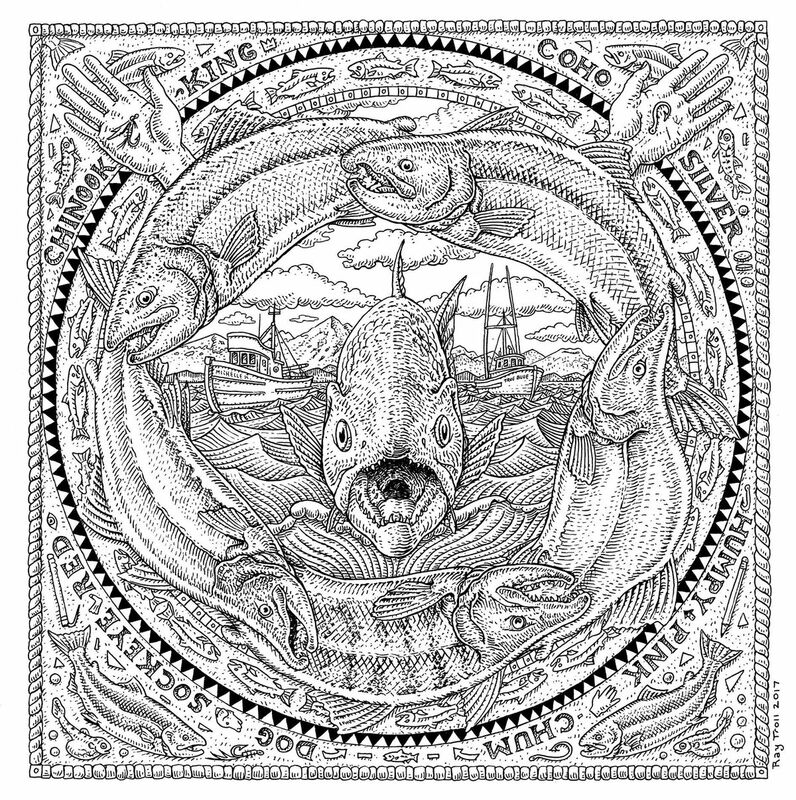 Salmon illustration by Ray Troll. We Alaskans have been bombarded with road signs, television spots, internet ads, and corporate testimonials about how we don't need Proposition 1 to protect salmon because Alaska law is good enough. Wrong. This media campaign obscures one crucial fact: According to the Alaska Department of Fish and Game, only a "fraction" of the waters salmon use are protected by Alaska law. So even if the law is good enough, is doesn't apply to most of our salmon habitat. From the early days of statehood, the Commissioner of Fish and Game has been charged with the obligation to specify the waters "important" for the survival of anadromous fish that are to be protected by Alaska law. This duty is embodied in Title 16 and is currently discharged through the Anadromous Waters Atlas and Catalog maintained by Fish and Game. Salmon are anadromous fish because their life cycles have both a freshwater and saltwater phase. The Catalog specifies the waters protected by Alaska law. Waters not listed receive little or no protection. The department says on its website that the Catalog specifies "almost 20,000" waters, but based upon thorough surveys of a few drainages, it is believed that this number represents a fraction of the streams, rivers and lakes actually used by anadromous species. Until these habitats are inventoried, they will not be protected under Alaska law. In the early days waters important for salmon were generally inventoried by Fish and Game biologists using their experience in the field, their best professional judgment and common sense. However, the department has since imposed stringent rules that now make it extremely difficult and prohibitively expensive to add to the inventory of salmon habitat in the Catalog. For a salmon stream, river or lake to warrant inclusion in the Catalog today, a "qualified person" must travel to that water body, physically observe or capture at least two salmon and fill out a nomination form, complete with GPS coordinates and photographs. Given that most of our unspecified inventory of salmon habitat is off the road system, helicopters are often required for access. During the past decade, our nonprofit land trust helped assemble teams of biologists and local Alaska Natives and raised money to send them into the remote regions of Bristol Bay to survey, find and document salmon habitat for inclusion in that Anadromous Waters Atlas and Catalog. We undertook this task out of fear that development proposed for the region was moving forward without any concern whether streams endangered by that development were eligible for legal protection. When we began in 2008, Fish and Game was not funded or directed to survey waters in Bristol Bay affected by potential development. We conducted our surveys in the fall, when rearing coho salmon would be at the furthest extent of their range. I was fortunate to participate in several surveys. To my astonishment, salmon were found in narrow tundra streams barely a foot wide, in creeks choked with alder, above beaver dams and even on top of the proposed Pebble mine deposit. Equally surprising were the streams we found with bank-to-bank spawning sockeye salmon that were not listed in the Catalog. Salmon were found in roughly 75 percent of the locations we sampled. These surveys were expensive — upwards of a million dollars. Most of the money paid for helicopter time, fuel and field support. By our calculations, it conservatively cost $1,000 for every mile of salmon habitat we added to the Catalog. Money spent to prove the obvious — in Bristol Bay most of the rivers, streams and lakes are used by salmon. If we hadn't looked these waters could still be unprotected. The observation of Fish and Game that only a fraction of our anadromous waters are specified in the Catalog is supported by our own field research. If nothing changes it will take many millions of dollars and, at the current pace, more than a century before Alaska law reaches all the waters entitled to protection. So, regardless whether our laws are adequate to protect salmon, the system for applying those laws is seriously broken. We should ignore this issue no longer. A key provision of Proposition 1 is the creation of a presumption that most of Alaska's waters should be considered anadromous unless proven otherwise — a reversal of the current presumption used by the state. Establishing a presumption simply reflects reality. Creating a presumption does not itself create new protections. It simply makes sure we don't overlook salmon streams that should be protected. The corporate opponents of Proposition 1 may, as they claim, conduct their activities with due regard for salmon. However, I have little confidence that most corporate interests will look for salmon before they dig up a stream if the law doesn't require them to do so. The presumption in Proposition 1 provides an inexpensive means and a reasonable assurance to all Alaskans that salmon using rivers, streams and lakes that have not been documented by Fish and Game will also be protected by Alaska law. It's a commonsense approach. Our salmon cannot speak for themselves, but we can speak for them. Vote yes on Proposition 1. Tim Troll is Executive Director of the Bristol Bay Heritage Land Trust. The Land Trust was organized in Dillingham in 1999. Ray Troll is a Ketchikan artist well known for his salmon art and fishy humor. They are brothers. Tim Troll is Executive Director of the Bristol Bay Heritage Land Trust, an organization dedicated to preserving the wildlife habitat, culture and history of the Bristol Bay region.